If you haven’t used it at all, you need to change that as soon as possible. This book can serve as a great introduction to it. If you already know NuGet basics, the book will teach you, how to take better advantage of it. And if you’re already a proficient user, it will probably still show you a new trick or two. Chapter 1, Using a Package Manager in Visual Studio, introduces you to NuGet, demonstrates its benefits, and teaches the basics of using it. It will guide you through the NuGet installation process, show you how to reference your first NuGet package, and demonstrate how dependencies between packages are handled. 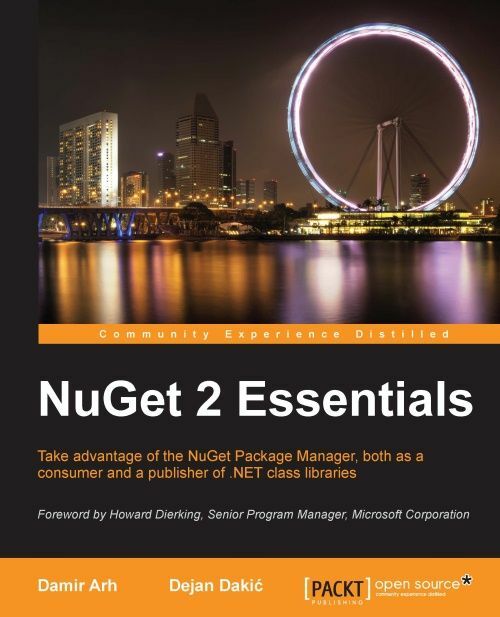 Chapter 2, Package Management, covers advanced aspects of using NuGet in Visual Studio. It starts out with two important aspects of NuGet packages: versioning and support for different target platforms. This is followed by a closer look at how NuGet plays along with source control systems. It ends with an introduction to the NuGet PowerShell console. Chapter 3, Creating and Publishing a Package, focuses on the basics of creating a NuGet package for a library. It shows you how to do it manually and how to automatically create it at the end of every build. It also explains package versioning and leads you through the process of publishing your first package in the NuGet Gallery. Chapter 4, Adding Features to a NuGet Package, drills down into the advanced features of NuGet packages. It describes the contents of a package and gives examples for each of the following features: multiplatform support, multilanguage support, and debugging support. It also explains which types of files can be included in a package and why you would want to include them. Chapter 5, Hosting an Internal NuGet Server, starts with the reasons to host your own NuGet server and explains how to choose the right setup among the three different options, based on your requirements. It includes detailed installation and configuration instructions for setting up any one of them: a fie system repository, a simple NuGet server, and your own NuGet gallery.